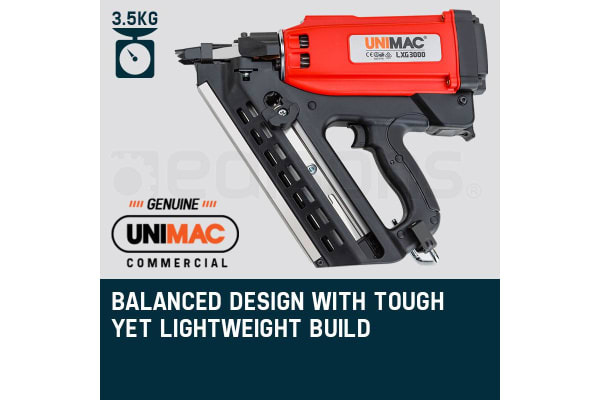 The NEW UNIMAC LXG3000 34° Gas Framing Nailer has landed and has already asserted itself among the most highly acclaimed models on the market. A must have for any tradesmen, builder or handyman, this class leading commercial nailer is designed and engineered to uncontested quality standards for greater reliability and improved durability. 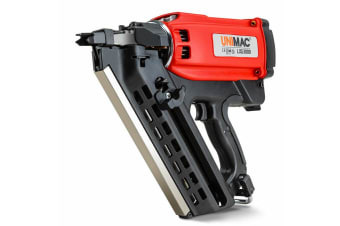 UNIMAC nailers are synonymous with enduring performance and the LXG3000 embodies this reputation like no other. It offers the highest continuous operation cycle on the market accepting 50-90mm framing nails, boasting a rate of 1,000 nails per hour. It comes with two ultra-lightweight 7.4V Li-Ion batteries, each of which provides 3,000 shots per charge. The LXG3000 features Full Sequential Actuation for maximum speed making it the ultimate choice for all types of timber and tasks, including Framing, Decking, Flooring, Crate/Pallet Assembly and much more. The unique quick-load magazine makes reloading easier, with more transparency to when you’re running low on nails. Its generous 48 nail capacity also contributes to greater productivity with less load intermission. Its ergonomically designed for prolonged use with a comfortable elastomer grip and 360° variable exhaust port. 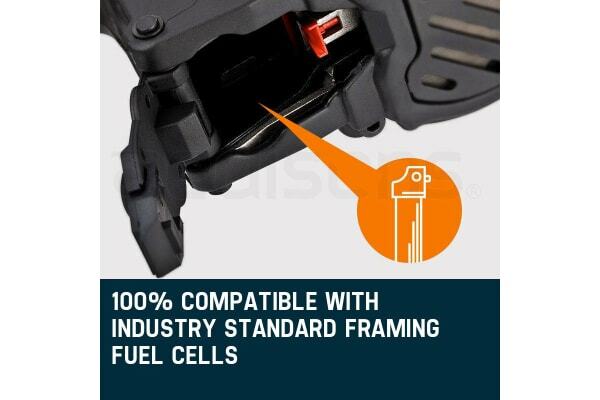 Importantly, the LXG3000 accepts industry standard framing fuel cells for added convenience. The LXG3000 is undoubtedly the durable and reliable performer you’ve been waiting for, manufactured to UNIMAC’s precise patented specifications. Order your very own NEW UNIMAC LXG3000 34° Gas Framing Nailer today! Please Note: Not recommended for use with 3 to 3-½ ring shank nails in pressure-treated lumber.